A drizzle of poppyseed dressing finishes off this spinach salad. 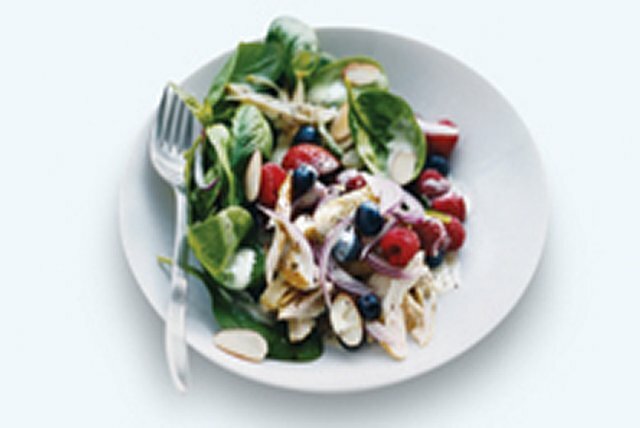 Made with fresh berries, toasted almonds, red onions and cooked chicken on a bed of baby spinach, this Chicken Berry Spinach Salad is anything but ordinary. Toss spinach with all remaining ingredients except dressing. Substitute coarsely chopped pecans for the almonds. The spinach in this tasty salad is an excellent source of vitamin A.